I currently have 2 RR's. Best dog breed in the world as far as I am concerned. They are smart, loving, loyal and great buds. I will always have Ridgebacks!!! Each to their own breed. When I wanted a dog I knew I wanted either a Rottweiler, a American Staffie or a Rhodesian Ridgeback which my deceased dog was all of these breeds. Lets say the moment I went to the breeder I had made my decision on the spot. My RR has the same temperament of his mother. Cheeky, intelligent, loving, loyal and friendly. He is a big boy weighing at 50kg at 19-months. But his the goofiest most loving dog. I am blessed to have him, his my pal, my rock and my furkid. My life wouldn't be complete without him, i just couldn't imagine him not being in my house this very moment I write this. I don't have kids and am single so his basically my one and only knight in shining armour. Sounds cheesy but its true. One of the best temperaments in a dog I have come across and they're beginning to be quite popular now. I reckon they will soon replace Labrador Retrievers as THE family dog. I love my boy and even though I wanted to kill him when he was teenager (MOST HORRIBLE PERIOD EVERY!) my patience and consistent in training has paid off in the long run. Hi David, my husband believes in Bull terriers, but my daughter wants a RR (begging him). We're scared cause we know little about this breed...but... Your buds are BEAUTIFUL ! David, we could not agree more! We will never own another breed. Our Ridgeback is 9 1/2 now, a little slower these days but still the greatest dog in the world. He's about to be joined by a brace - a male puppy next month and a female in Feb. what a blast that will be! What a great picture of you and your two buddies. 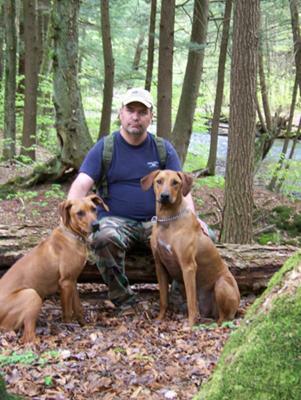 I'm a Labrador Retriever guy, but your comments make the Rhodesian Ridgeback sound very tempting.